Tri-Lakes RPC is a new church plant of the RPCNA now meeting in Monument, CO every Lord’s Day morning at 9:45. 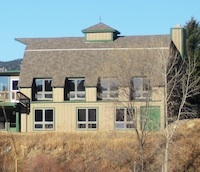 “Tri-Lakes Reformed Church is a recently “daughtered” congregation of the Springs Reformed Church (RPCNA), and we are currently meeting at the Woodmoor Community Center (aka “The Barn”) located at 1691 Woodmoor Dr. in Monument, CO.
“God desires to be acknowledged as holy by those who approach Him in worship (e.g. Lev. 10:3; Heb. 12:28-29). Thus we must approach Him on His own terms. His terms are dictated to us in the Bible, and we can summarize those terms by what is known as the biblical “Regulative Principle of Worship”. The RPW stated simply is, do what God commands, and whatever is not commanded, do not do (Duet. 12:32). Please give your prayer and support to Tri-Lakes RPC! This entry was posted in Church Plants, RPCNA and tagged Colorado, Exclusive Psalmody, news, RPCNA, Tri-Lakes RPC, worship. Bookmark the permalink.